At the end of each workday, I like to come home, take a shower (wash the germs off! ), eat dinner with the family, and then curl up with my laptop and catch up on some TV and blogging. It may sound lame to some, but for my introverted personality, the chance to recharge like this is perfect. I like quiet time and am grateful that my family not only gets that but really respects my need for it, too. I sound like a hermit, but it's how I de-stress after a long day of work (or just every day, if I'm honest). De-stressing for me also comes in the form of 6am workouts/Blogilates, quiet time journaling and reading She Reads Truth in the evening, and talking it out with my friends and co-workers. It's also the chance to check my Instagram at the end of the day, listen to Hillsong before bed, and then baking on the weekends, too. That said, there's obviously a lot of different ways to de-stress and gain some sanity in your life. And I'm interested to hear how you de-stress. Do you exercise? Pray? Sing? Party? 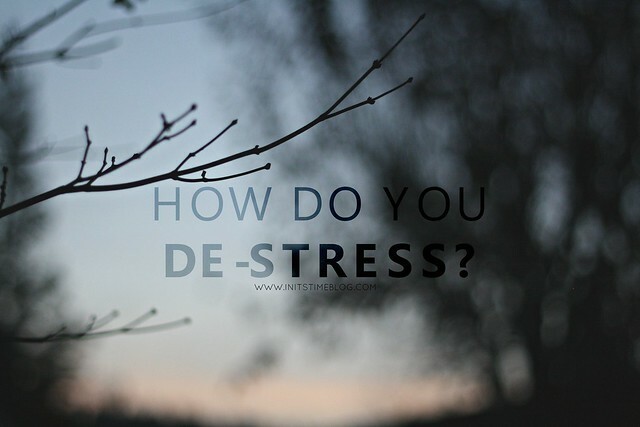 I'd love to hear your tips, tricks, and advice for de-stressing! Reading. Real books. Not blogs. Something about the quiet of the book and no internet noise or blinky emails or notifications is WONDERFUL! I'm the same, in that I need to be by myself to de-stress. My husband says his destressing is hanging out with me...but it doesn't work for me. I usually play some FarmVille 2 (haha no judging!) and read blogs with some hot chocolate or coffee. Sometimes I just lay in bed with my dog, too. Bubble baths! And a good book! 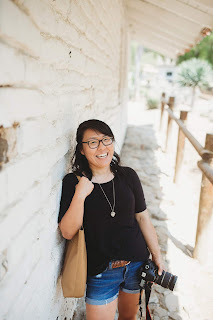 Solo quiet time is crucial for me too, and tv + blogging is a good way to do it! I also rely heavily on walking/running, when I can either just let my mind open up and wander or focus on working/thinking through an issue. I agree with Meg. Reading is a good de-stress. Of course, not if I'm reading a stressful book. ha! Running helps me de-stress. And also cooking (most of the time). I love having some time to veg out and let my brain not have to focus on anything. I really enjoy stretching too! At the end of a long/stressful day I have some stretches that I do that and they REALLY help me relax and wind down and prepare for bed. I also enjoy reading! I get in bed early so I can sit there for an hour and read or journal while listening to music and burning a candle. There may or may not be tea. I also love doing yoga or watching something I love (You've Got Mail, Runaway Bride, Gilmore Girls, Anne of GG). Girl, I don't judge at all! :) I play computer games, too (primarily Sims) and realy need to get some alone time to recharge and de-stress. :) I hope you get some alone time to recharge soon! Time to veg out is a must for me. I really need to be able to decompress through something that doesn't require too much of my concentration/energy. :) Stretching sounds like a reallly good idea! I do pilates/yoga in the mornings but never thought to stretch before bed. I love that idea! Quiet mornings are THE best. I'm not a coffee person, but that morning sounds perfect to me. I wish I had those more often! I think I will! I don't know much about Anne of Green Gables but I do know that I get teary-eyed pretty easily. :) Thanks for the recommendations! Reading is one of my biggest de-stressors - either a novel, or my Bible, or Biblical commentary. Anything, really! I don't normally have time to read "for myself" (I'm an English major, so I'm always reading for class). Anytime I have a minute to read something I want to read is great! I also like journalling, watching a movie I've seen before, or scrolling through Tumblr. Even though I wasn't an English major, I get what you mean about actually squeezing the time to read for pleasure. I so remember that as a student! :) It's definitely made me truly enjoy whenever I get to read what I want when I want to, though! And journaling and watching new movies are the best. I love that you added in the detail of watching new movies--I'm the same way! I only have a very short list of movies that I can re-watch.